Scorching of leaf margins caused by bacteria. The disease typically progresses throughout the tree for up to a decade causing so much dieback that the tree eventually dies. Symptoms and damage are usually most visible on pin and red oaks, but shingle, bur and white oak can be affected as well. Additionally, BLS can infect elm, sycamore, mulberry, sweetgum, sugar maple, and red maple. There are also numerous asymptomatic hosts. Xylem-feeding leafhoppers and spittlebugs spread the bacterium from one tree to another. 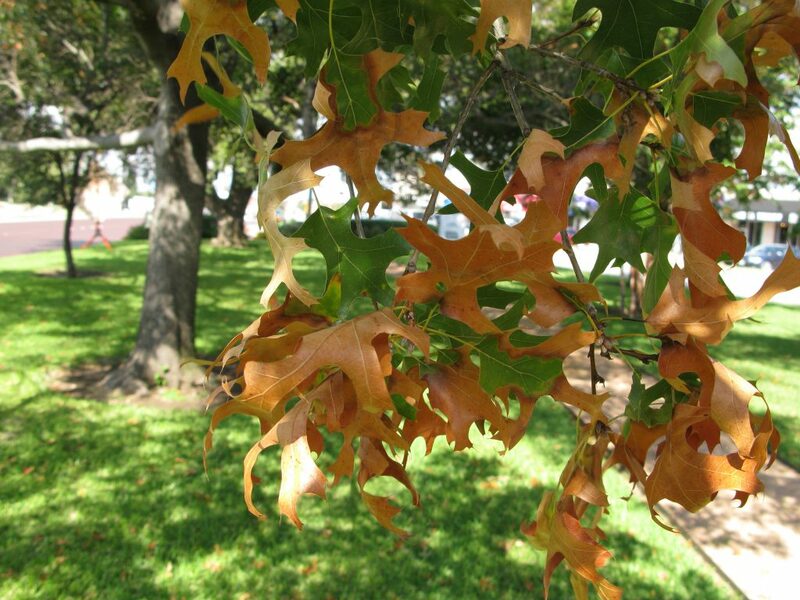 BLS is sometimes mistaken for other leaf diseases, or for drought and heat stress. The unique late summer development of BLS symptoms is the defining characteristic. Thanks to recent advances in DNA analysis, BLS can now be detected at any time of the year, not only when symptoms appear late in the growing season. This allows an arborist to determine well in advance if a tree requires treatment. Experience at Bartlett Tree Experts has shown that BLS can often be effectively suppressed for many years if the tree is treated and provided with good cultural care, especially if the disease is detected early.